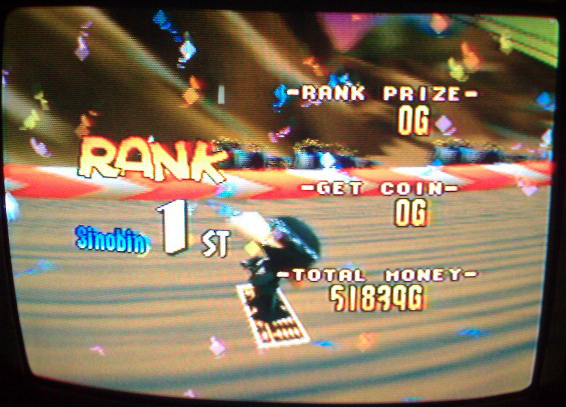 I think it is a well-documented fact that I am a huge fan of Snowboard Kids, an N64 sleeper hit. In many ways, it rivals Mario Kart 64, but this is an argument for another time. A couple months ago, I had incentive to dig out my N64, find my controller paks and extra controllers all because I managed to get a free small craigslist p.o.s. TV. After all these years, I was stunned to find the controller pak that had my Snowboard Kids data, let alone have it still function. Just goes to show Nintendo durability. Long story short, I noticed a spelling error in this Atlus published game. Shinobin is the only secret character in the game, who becomes unlocked basically as you complete the final secret level of the game. This speedy and well controlling ninja character, however, is spelled two different ways in game! Either way, it shocked me that I didn’t notice this error before as I played the hell outta this game when it was released in the late 90’s. The truth is, I was to excited to care. But now, in my older and more critical years, this appeared to me like a dent on a brand new car. That’s ok though. Snowboard Kids, I still love you. Snowboard Kids 2 is also a good game. Snowboard Kids DS though…. Not so much.